This is one of those moments that just floors me. Almost half a year ago my friend Gina and I were talking about writing, and I was expressing some frustration at wanting to write again, but not being sure what to write about. She recommended that I write about farming (and she has, for her efforts, been pushing me in this direction for well over a year now). I was hesitant – I’m not experienced enough, I still don’t really know what I’m doing, there are a gazillion other farmers, solo ladies or otherwise, who should be writing this book instead of me. I have become a master of excuses over time. I could go on like this for days. But when I sat down at my computer and started to outline what such a guidebook would look like, everything started to flow. I was astounded. Even though most of me felt like I’ve been spearheading this big hoax where my world thinks I’ve gone on to run this badass farm, the small part of me that knows this is actually true reared up and took over. Things that have been floating around in my brain since 2012 made their way onto the pages, and suddenly I was spending my spring mornings up at 5am, typing away at the desk in Little House and still fielding that half-surprise that I had something to say. One day, sometime in June, I finished. And then I hid it. I was embarrassed, for all the aforementioned reasons. I was self conscious. Liz the writer girl in high school and Liz the journalism girl in college wasn’t Liz the farm girl as a pseudo-adult, right? That ship, which may have been sinking before it even set sail to begin with, was way out to sea. It was good to get this writing bug out of my system, but that was as far as it was worth taking it. And so I went into the farm season, where everything is swallowed by the mad dash. There were a couple of moments where I mentioned writing a little field manual to some friends, a couple of e-mails shot off here and there, but that was all. And then, sometime in the last month, I started to think that maybe this wasn’t all. That maybe, if someone out there was interested in starting a farm and had no idea where to begin, that this could help. Or, at the very least, they could learn from my haphazard experiences and see that you don’t have to have a totally orchestrated plan to jump into this and do well. It helps – I know a dozen farm friends off the top of my head who are more organized than I am, and who have beautiful, fruitful spreads that make me look a mess – but everyone’s path is their own, and yours can be as messy (or messier?) than mine. Certainly less messy, if you’re looking for less stress. So I started to edit. I coerced my dear darling Liv Biagi, who was my editor co-pilot for our college paper back in the day, to give me a thorough look. I started to tell the people around me I was working on a book. I slapped together a cover. I held my breath, crossed my fingers, stopped trying to read it AGAIN for spelling errors and used the advice from my friend Kayla, an amazing woman from Francesca Lia Block‘s spring writing class, to publish it as an eBook. So here it is. 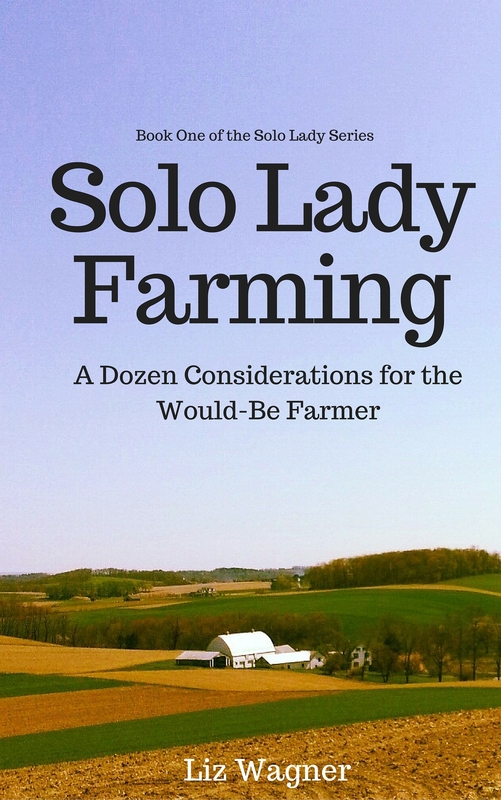 Solo Lady Farming: A Dozen Considerations for the Would-Be Farmer. Book One of the Solo Lady Series may be a little facetious, but I liked the top line saying that – and who knows? I have really cool solo lady friends who are designing and building their own houses and traveling for months in other countries. Maybe they’ll be the next to contribute to this collaboration of strong women doing cool things. I hope so. It feels right. Back to being floored. I wrote a book! It has taken me the better part of six months to stop feeling self conscious and a little embarrassed when I say that. Who am I to have written anything? A girl who started a farm, that’s who. In getting past the hangups of self worth, really feeling that has been a big step. One that I’m proud of. And one that leaves me reeling with gratitude for my CSAers,who believe in all of this enough to share their trust and financial resources with me each season, and for my family and friends who didn’t laugh when I said, “I’m writing a little manual for people who might want to do what I did,” and for everyone who reminds me when I’m floundering or down that I’m awesome. Thank you, thank you, thank you. Congratulations on writing and publishing your book! It would be nice if the La Salle Collegian could carry a story about it. I hope you will contact them.